That’s Why They Call Them Comfort Keepers! In the eyes of a child, parents are invincible, beacons of physical and emotional strength, but as they age, the roles truly do the reverse, and the children become the caretakers. But how do we give the best care to our aging parents when we lead such busy lives? The dynamic of the family household has changed tremendously over the decades. Generations past could support and care for aging parents because most mothers were not working outside of the home, already assuming the role of caretaker. Three very crucial elements of the family structure have changed. First, mothers are working, second, children are taking part in more extracurricular activities, and third, the media has made aging parents feel that they need not burden their children, with advertisements for self-care and funeral preparation, so they are less willing to enter our busy homes. With aging parents left living on their own and crime against the elderly on the rise, who do we trust to care for them? My parents passed away a few years back, and like most children who have lost parents, I wish every day they could still be here with me. When they were still alive, they began to rely on me for home-related issues, and I began to realize if I wasn’t there to help, people could take advantage of them. This is a major reason when I became a Realtor®, I took the course to be an accredited senior agent and have developed a network of trustworthy companies I can refer to my senior-aged clients. Companies I would refer to my own family. If my parents were still alive, they probably would need care at this point. But who would I consider for such a crucial and heartfelt decision? I sat down with Adam Budrewicz, Owner of the Windsor Essex branch of Comfort Keepers, and realized he had a very important story to tell, one that explained his dedication to helping people. From 2004-2007, Adam was mainly automating factories as a Robotic Designer/Programmer, but then his health took a turn in which he required three brain surgeries, three lung surgeries and a defibrillator for Atrial Fibrillation. It was a long recovery which required care and rehabilitation but once he recovered, his call into the healthcare industry with a strong desire to give back to others was born. He left the automation field for good in 2007. “During my recovery, I was once referred to as a number, which shocked me, and I became extremely determined to bring true personal care to our community, that I would be personally involved in, so nobody would feel like a number again! I researched a variety of options and was thoroughly impressed by the Toronto-based Comfort Keepers In-Home Care and their system of Interactive Caregiving™, a system based on forming a bond with the individuals they support and involving them in their own care, so the client looks forward to our visits,” says Adam. Comfort Keepers mission is to provide their clients with the highest level of quality of life that is achievable and to treat each of their clients with the respect and dignity they deserve, as though they were caring for a member of their own family. Adam extends that mission along with his own friendly, professional care to Windsor Essex aging population. Comfort Keepers believes in keeping individuals social and not isolated; forming a true bond and having an individual look forward to their visits. Adam says, “having clients mention our caregivers by name rather than job title, “Gail is coming today” rather than “A nurse is coming” means a great deal to us.” Once an individual truly feels comfortable and open with their caregiver, the assistance is enjoyable and seamless. Comfort Keepers promotes independent living and preservation of your loved one’s dignity. Research shows happiness and quality of life can contribute to longevity. If you are worried about loved one because they are losing weight, falling, forgetting to take their medications, having difficulty with personal hygiene, missing meals or experiencing memory loss or mobility issues, it’s time for the extra tender-loving care they will need in the last stages of life. Walk around their home… are any tasks are not being completed; housekeeping, home/car maintenance, un-opened mail or leftover medications? Also, take note if they are in need of emotional care and experiencing loneliness, isolation or depression, Comfort Keepers specializes in Alzheimer’s and Dementia care, and elderly depression. Approach this subject very sensitively and don’t wait until a life-altering event determines the outcome of the situation. Do not discuss these subjects at family gatherings as it can make the parent feel pressured, threatened, uncomfortable and defensive, which can counteract their well-being. Do not try to resolve everything at once. The goal is to open an ongoing, honest dialogue about your parent’s future, to share information and to understand your parent’s wishes and needs so that decisions can be made. 1. Include all family members and meet with and discuss all prior to approaching your parent so all are on the same page and no one feels left out. 2. Discuss responsibilities with family members such as home maintenance, yard work or bill paying—they would like you or someone else to help with to make life easier. 3. Transition into the conversation by sharing your own experience you’re your loved one, about topics like retirement or estate planning, so they feel they can relate to you. 4. Give them enough time to share their wishes, maintain good eye contact and communicate caringly, up close, without invading personal space. 5. Ask open-ended questions that encourage your parent to share feelings. Then sit back and carefully listen to learn what is important to him or her. 6. Offer options, not advice. Pose questions and offer more than one acceptable solution. Ask your parent which choice they prefer. This involves them in the decision process and enables them to exercise control and independence. Speak with respect. Approach the discussion as a partner with your parent. In other words, make sure your parent is an active participant in the conversation. Stop to listen and respect their desire and need to maintain control over their lives. Avoid reversing roles in the discussion, that is, you acting as the parent and your parent as the child. This could cause your parent to resist your attempts to open discussion. Keep it simple. Our clients are part of a vulnerable demographic where trust is key to their happiness. Research the services that may be coming into your home and make sure they complete background checks and are bonded for your safety. Once trust is established, ask where they keep important documents such as insurance policies, wills, trust documents, investment and banking records, tax returns, living wills and durable powers of attorney. Explain that you want to be prepared to help them when needed. This could also serve as a way of finding out what plans he or she have already made and what needs to be done. If trust is not established, and your parent resists your efforts to begin the discussion, consider Involving third parties if He or she may be more open to the guidance of a respected non-family member, such as a doctor, a member of the clergy, a geriatric care manager, representative of an area agency on aging or trusted friends and neighbors who may have already helped a loved one in a similar situation. If they are further reluctant to receive extra care they need, Discuss different options and listen to their preferences. Let the individual know that there are no contracts; if they give it a try and do not like it, they can stop. Let them know you would appreciate knowing they are safe and remind them it is to make life easier and more fun. If your loved one is realizing that simple tasks are becoming more difficult and bringing the subject up to family, friends or healthcare providers, ask them to share their preferences on how they want to be cared for. Do they want to continue living at home but with the help of a caregiver who can assist with certain tasks around the house? Can they still prepare nutritious meals for themselves or would they prefer having meals delivered or having someone prepare meals in their home? “After my experience, says Adam, “I felt I needed to raise the bar in caregiving, with dependable, consistent caregivers who are open and honest.” Adam personally conducts all of the hirings and “only hires caregivers he is proud of, and wishes could have assisted him during his own recovery.” Your personal “Comfort Keeper” is supervised, thoroughly screened, bonded and covered by Worker’s Compensation, trained specifically in Interactive Caregiving and matched to your family’s personal preference. They then are taught the Comfort Keepers system of Interactive Caregiving™. The heart of this is allowing individuals to take as active a role in their own care as they are able. Our caregivers interact with individuals in physical, mental and social activities they look forward to—going on walks or dancing, reminiscing, working on crossword puzzles or a cherished hobby, visiting favourite people and places. The result?… Healthier, safer, more fulfilling lives! Adam will personally visit and listen to the family’s needs and wants to create an individualized plan of care. Then, he will assign one caretaker to your loved one, so in time it feels less like a service call and more and more like a friend visiting. Comfort Keepers strong back-office support system and specialized online software simplifies the process and allows families to visit their secure online portal to follow their loved one’s care at any time. Comfort Keepers also provides a variety of safety technology like emergency response systems, automatic medication dispensers and around the clock emergency monitoring for your peace of mind. They are only a phone call away and available 24 hours a day, 7 days a week to discuss your care plan or answer any question you may have. Comfort Keepers offers all levels of services to keep an individual safe and in their home. Comfort Keepers are available to provide clients company and engage in conversation or to sit down to share a meal together. Social contact such as this is proven to enhance the health, happiness, and quality of life of the individuals we visit. Comfort Keepers housekeeping services include vacuuming, dusting, sweeping and mopping floors, cleaning bathrooms (sinks, tubs, showers, and toilets), cleaning kitchens (sinks, appliances, counters, taking out the trash), straightening all rooms, organizing closets and drawers, and cleaning easily accessed interior windows. Comfort Keepers shop for groceries at stores of their clients’ preference and run errands, such as picking up prescriptions or going to the dry cleaners. Clients may choose to stay home or help with the shopping and errands as an excellent way to stay active and engaged. Comfort Keepers will use any coupons provided. Comfort Keepers assist clients with washing and combing their hair and other grooming tasks to enable them to feel good about their appearance. Comfort Keepers also offers a Home Hair Stylist to visit clients in the comfort and convenience of their own home. Comfort Keepers provides transportation to medical appointments, barbershops, beauty salons, shopping, or wherever else a client wants to go. Getting individuals “out and about” is good for their mind, body and spirit—and an integral part of Comfort Keepers’ Interactive Caregiving™. Comfort Keepers can assist in ensuring you or your loved ones are on schedule with your appointments and make sure your voice is heard. They can arrange all of your appointments, make sure you are there on time and ask any important questions to keep your health and safety a priority. Comfort Keepers assist clients with installing grab bars, constructing ramps or dealing with plumbing or electrical issues. They provide trusted, quality tradespeople to get the job done right and also offer services such as snow removal in the winter and gardening and lawn maintenance in the summer. Comfort Keepers offers basic and advanced foot care right in the client’s home. Our specially trained Foot Care Nurses assist with the health and appearance of your feet and are able to assist individuals with diabetes or thin blood. Also, for other individuals not looking to travel to a nail salon, Comfort Keepers offers individuals the convenience of home pedicures. Comfort Keepers can administer medications or help ensure that clients take their own medication as prescribed. Comfort Keepers can assist with opening medication containers, reading labels and reminding the client when it is time to take a dose. They also offer a wireless automatic medication dispenser in our line of monitored Safety Choice products. Comfort Keepers compassionately and sensitively care for individuals, helping them maintain dignity and self-esteem as they receive help with the activities of daily living. Through this caring approach Comfort Keepers help to lessen clients’ embarrassment associated with the loss of independence related to incontinence and need for toileting assistance. Comfort Keepers help clients look and feel their best. These services enhance clients’ mental as well as physical well-being, helping them feel positive about their appearance. Bathing not only cleanses the skin but goes deeper to refresh the spirit, provide relaxation and stimulate circulation. Comfort Keepers assist clients as needed with mobility to help them maintain as active a lifestyle as possible. Being able to get out and about offers both physical and mental health benefits to individuals. Physical health benefits of activity include increased stamina and energy, a strengthened heart, lower blood pressure and improved digestion and sleep. In addition, activity improves mood, releases stress and increases mental alertness. Comfort Keepers are trained to move and place clients incorrect posture position to promote health and safety and proper functioning of the body’s many systems. Proper transferring and positioning from or into beds and chairs eliminate pressure areas on the skin, reduce weakening and stiffening of muscles, and encourage proper breathing, digestion, and elimination. For a number of reasons, individuals may need help feeding themselves. This loss of independence can be difficult to accept. Comfort Keepers understand this and make the extra effort to turn mealtime into an enjoyable social time. In addition, Comfort Keepers help make certain that their clients stay on prescribed diets to prevent or control a wide variety of medical conditions such as heart disease, diabetes, and osteoporosis. In general, Comfort Keepers enables clients to eat a well-balanced diet that provides the energy needed for active living and nutrients for disease prevention, healing and healthful living. Comfort Keepers provides our community a full range of services to continue living safely and independently in their homes. Comfort Keepers Nursing Care Services assists with medication management, wound dressing, palliative assistance and overseeing Client Care Plans; Comfort Keepers always makes sure our clients are safe, happy and in the right care. As experts in senior care, Comfort Keepers also assists with hospital discharge, those recovering from an injury or illness and seniors with physical and developmental disabilities or rehabilitation. They are an approved provider for Veterans Affairs Canada. If your loved one needs placement in a full care retirement or nursing care facility, our Comfort Keepers can still provide care after the move. The physical condition of a home may be a reason to move into a retirement home. Comfort Keepers provides extra personal and social care in retirement homes; extra baths, incontinence care, assistance with mobility or feeding. Also, the friendship and bond our Comfort Keepers form with your loved one is priceless in fully keeping the individual social and not isolated. This specialty around-the-clock service provides your loved one their greatest quality of life. Your 24-hour team of Comfort Keepers truly bond with your loved one while ensuring they are safe and comfortable in their home. This service offers care that assists with difficult tasks while allowing your loved one to be interactive in their own care. This specialty service provides family’s twenty-four-hour piece of mind, personal attention and the care of a Comfort Keeper. Learn about available services to help you as you age. Physicians, social workers, geriatric care managers and other healthcare professionals can guide you in this, and your local Area Agency or Council on Aging can provide a listing of services available in your area. After our conversation, I was filled with admiration for Adam and would trust him with the care of my own my parents, if they were still alive, and as an Accredited Senior Agent, I am thrilled to securely add this service to my referral base. 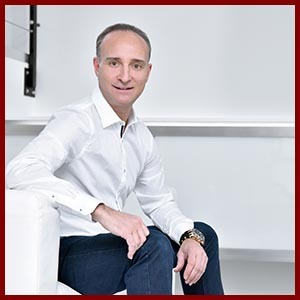 I look forward to assisting Adam’s clients with my knowledge and expertise as well. We would find the best care for our children, why wouldn’t we want the same for our aging parents! Comfort Keepers is located at 400 Chilver Rd. Suite 210 in the heart of Olde Walkerville. Call Adam Budrewicz, Owner of the Windsor Essex branch, directly for a no cost, no obligation, in-home consultation, at 519-946-1001. Visit their website at windsor.essex.comfortkeepers.ca. It could be the most comforting call of your life! June is Senior’s Month! Remember to spend a little time with your favorite senior. It will mean the world to them. 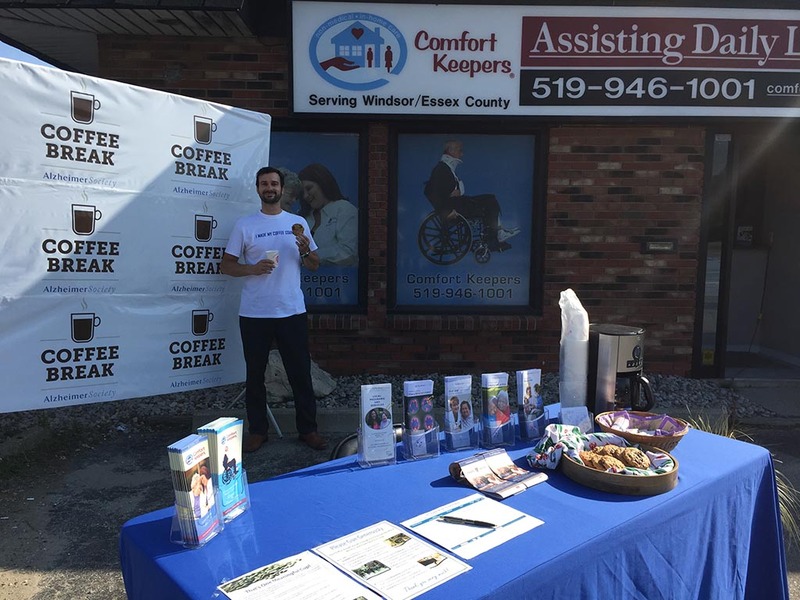 Photographed is Adam Budrewicz, bundled up outside of Windsor Comfort Keepers location hosting an Alzheimer Society Coffee Break®. Coffee Break® takes place in October and November each year and is the Alzheimer Society’s major annual fundraiser. Click here to host a coffee break http://www.alzheimer.ca/en/Home/News-and-Events/events/Coffee-Break/Host-Coffee-Break.